The Mafube Local Municipality has resumed the electrification of 2 105 households in Namahadi Frankfort after the project was halted due to lack of funds. The municipality whose towns include Tweeling, Cornelia and Villiers wants to ensure that about 700 households in Namahadi are connected to the electricity grid during this financial year. Mafube Local Municipality mayor, Jabulane Sigasa, is happy about the resumption of the electrification project. “Out of 2 105 houses, 600 houses are enjoying benefits of having electricity while we are busy connecting power into 500 houses in the current financial year. Last year we hoped to connect 800 houses with electricity but we had to halt the project after our funds were not sufficient to cover the other 200 houses,” said Sigasa. Namahadi is situated about 55km east of Heilbron and approximately 120km south east of Sasolburg. The R34 provincial road from Kroonstad to Kwazulu-Natal extends adjacent to the Frankfort town of Namahadi. He said the municipality has secured R22.1-million from the Municipal Infrastructure Grant to complete the project. “We are hoping that we will be finished with electrification process by 2015. The installation of those 200 households will also be added to the current target of 500 houses that will be connected this year. I am also happy with the progress made by the contractor and the quality of work done,” added Sigasa. The department of energy has also contributed R1-million to the project. 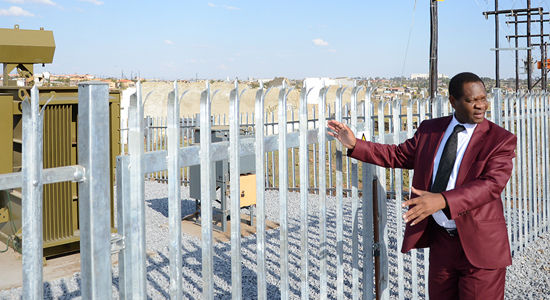 However, R6.7-million was also spent on electric connection to the households and substation in Qalabotjha while 300 households were completed in Mafahlaneng.